Albion boss Chris Hughton says he has plenty of options if the club do not sign any more attacking players before the start of the season. Brighton begin their debut Premier League campaign at home to Manchester City on August 12 and so far Pascal Gross and Izzy Brown are the only attacking additions to the squad. 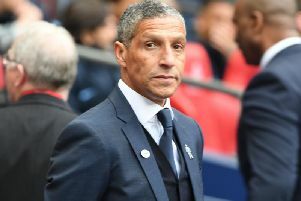 With Sam Baldock struggling with a calf injury and Anthony Knockaert (ankle) touch and go for the season opener, Hughton was keen to stress he still has plenty of options in forward areas. Glenn Murray and Tomer Hemed are out-and-out strikers, Gross and Brown can both play the number ten role, while winger Solly March has been in outstanding form so far in pre-season. Asked if signing another striker is a priority before the opening game, Hughton said: "I've certainly got options. Pascal is very much a number ten and Izzy Brown is a number ten, so what you can't afford to do is drive yourself mad. "When and if it's right, players will come in. If that doesn't happen, what you have to do is what you've always done. That is work the hardest you can to get the best out of the team. "Any new signings we'd prefer sooner rather than later, as everybody would, but sometimes that's not the case."